The Public Transport Corporation (PTC) has recently undergone a major “transformational change” through the introduction of the “Service Now” service management program. The program was undertaken to provide the corporation with a structure that would allow more flexibility in meeting the ever changing needs of its internal and external customers. Public transport in Australia has a very rich heritage beginning in the middle 1800’s when the first colony in Melbourne was being developed. It has grown to rank number 71 in Australia’s largest corporations in 1990, with net annual revenue of $1.7 billion, employing over 19,000 people, representing three generations with the organization. The “Service Now” program is primarily about cultural change. The program objective is to change the cultural focus of each employee within, to one that is service and quality based, centered on the customer and committed to high standards of service delivery. Public transport is a service business and needs to be run with the customer as the key focus. For example: on a long distance train journey, the points of customer contact may include telephoning to make a reservation, picking up a ticket, booking in luggage, finding the correct platform, finding the allocated seat on board, purchasing a meal and ordering a wake up call. At every contact it is essential that a favourable impression is made. These impressions or “moments of truth” impact on the customer’s perception of the organization. If they are well managed the customer will return. If they are not, the customer may choose a competitor or decide not to travel at all. Success in service management means understanding the "moments of truth” in your organization and ensuring your staff are positively focused on them. 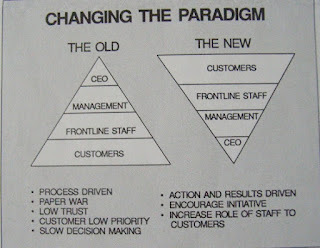 A new organizational chart was implemented that has taken the old pyramid structure and inverted it. 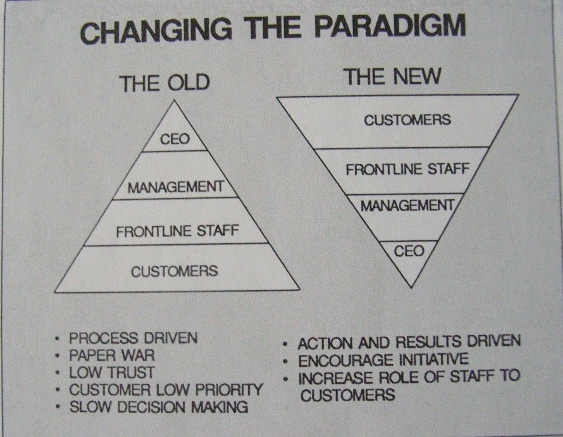 The new structure puts the customer on top, followed by the front-line staff and at the bottom are the management and the CEO. On paper the process of change looks easy, but as any person who has undertaken organizational change can attest, it can be tedious and difficult to achieve. Ian Stone, Chief Executive Officer of the PTC, has lived the program since its inception, and has spread the message of change to workers first hand. In staff training sessions, he makes a point of giving out his direct phone number, so staff can take their questions or problems directly to the top. 1. Customer research to obtain perceptions of the company and provide a common base for assessing change over a period of time. 2. Staff member surveys questioning job satisfaction. 3. Strategy development on which to run the new organization. 4. Educate the organization by revealing the results of the staff survey and outlining the new strategy. 5. Implement the strategy to fix the problems that have been identified in the research. The important part of a major organizational change is to keep the change foremost in the minds of all employees and not to let the emphasis slip. The PTC has put forward a number of initiatives that are now part of the formal organization and that constantly reflect the change to employees. Some of these initiatives include, the “Have your Say” and “Service Excellence” programs. The “Have your Say” program aims to give staff members from all areas of the organization an opportunity to meet with customers and discuss with them how the PTC’s service can be improved. The “Service Excellence” awards recognize employees who have provided outstanding levels of service. The new initiatives create a great bonding as they provide all employees with a common goal. An event that highlights this bonding was the “Opening Day” in October 1991. This was the first time employees had the opportunity to show the new customer service program to the public. The excitement and publicity generated by these activities paved the way for future events and demonstrates the PTC’s new direction. One way the PTC has measured the success of its customer service program has been by keeping track of its customer complaint letters. Since the inception of the program, complaint letters received by the PTC dropped by 30 percent and the number of complementary letters increased. The change to service management is now well underway throughout the Public Transport Corporation, reflected in its new structure, allowing the empowerment of front-line staff and providing a clear mission for every employee.